Just took a more in-depth look at this. I had a feigning interest (barred only by $$$$, as usual), but lost interest completely upon seeing a) Kaby Lake CPU (no Windows 7 support), and the Ultrabay doesn't have 2nd battery or serial/parallel I/O connector, both of which I use very regularly in my T601F at work. Ah well, guess I live a little too far in the past. I just got my T70 motherboard. I received my new T60 in the mail yesterday so I hope to start the procedure to construct the laptop soon/this weekend. One thing I can't find information about, is the SATA connector. Im away from my computer so I don't have a photo. It came with the custom somewhat rough heatsink as well as a small pcb with what appear to be sata ports. The instructions don't seem to mention what this is for. I assume an adaptor to use the ultra bay with? Does anyone know? ElusiveRoberto wrote: I just got my T70 motherboard. I received my new T60 in the mail yesterday so I hope to start the procedure to construct the laptop soon/this weekend. Most likely it is a cd drive sata connector which is smaller than a hdd one but looks similar. Good luck to your build and 4:3 for all!! Windows 7 is supported. The other ultrabay connections are definitely an unfortunate loss, though. The small SATA PCB is the extension for the 15" chassis. If you use a 14" chassis, you omit it. The original 15" T60 has an equivalent part. Hey Seggybop, you've been using the T70 for a while now right? Could you give some thoughts on the general experience, issues, etc.? It's still kind of early for a real review, but here are some weird/notable things. Generally everything is working exactly as you would expect for a modern laptop with a 7700HQ. I have 32GB of RAM and a 1TB Samsung 960 Pro SSD, running Windows 10. I had one unexpected crash the day I assembled everything. Screen blacked out while using Chrome and speakers started blaring static. It hasn't happened since, possibly as a result of updating the BIOS. By default, on the Balanced and High Performance power profiles, the CPU runs close to full turbo all the time (~3.5ghz), and doesn't throttle at all (from power or heat). Normally you see people trying to get their laptop to stop throttling, but I need it to start. I think the necessary settings exist in the BIOS to correct this but I haven't done it yet. The mini displayport might have the same compatibility problems as X62. I'm using a Dell 3007WFP-HC through an Accell active dual-link DVI to mini displayport adapter. This may sound weird, but if I have images on the external monitor beyond a certain complexity (say a landscape photo taking more than 1/3 of the screen) the connection will drop, try to reestablish, and then drop again in an infinite loop. I think this indicates that the displayport signal is really weak and dropping a lot of packets (higher complexity / less compressible image data would be less fault-tolerant). This requires more testing with other monitors before concluding anything. VGA worked fine on an old 1280x1024 display I used to test. There was no slack in the wifi lines inside the display housing, so I'm still using only one antenna. Performance is still OK. I've spent a lot of time experimenting with external GPU connections. Running a GTX 1080 from an M2 or mPCIe slot works, but it disables the internal display. The internal GPU can be forced on in the BIOS, but it doesn't activate. In order to feed the output from the external GPU to the built-in display, or show anything at all on it, the Intel GPU needs to work. T70 seems to enumerate PCIe devices only at power on, even if you enable hot plug in the BIOS, and it disables the internal GPU if it detects another discrete GPU connected. Normally the plan to get both GPUs working is to power on the external GPU a few seconds after the laptop powers on, but on T70 it ignores any further devices at that point. Thanks for your response! Since it seems to be at a constant turbo boost, are the temps good? Much heat at the bottom of the laptop? This is a little bit concerning Hopefully it will be fixed soon as it seems to be related to the bios. Let me know if you make any progress on running the internal display! EDIT: Also, how's the battery life? The CPU temperatures were totally miserable initially. 20-30c discrepancy between the highest and lowest core temperatures under load. The heatsink was making extremely uneven contact with all the pressure on the right side of the die. I lapped the contact plate (you can see from the pictures earlier that it was pretty ugly) but there wasn't any effect. Next, I tried removing a lot of material from the frame around the inductors next to the CPU, as the heasink was squishing down on them and possibly limiting the travel. After that, the pressure shifted from the whole right edge to concentrating on the bottom right corner. Removing some more frame material didn't seem to affect it any further. With those alterations, the bottom right heatsink screw loosened all the way, and the bottom left/upper right screws partially loosened, I have all cores within 7-8c under load now. It's not great but I'm still messing with it. If I can't come up with any mechanical solution I'm going to try some fancy liquid metal TIM and see if that compensates. If anyone has any suggestions, I'd appreciate them. I haven't tried running from battery much but I have an original T60 battery so I'm not expecting much from it. I'll get a new battery at some point soon. Fan of both ThinkPads and FrankenPads alike! Hi Seggybop, I also bought a board and modified a Frankenpad to become my T70. I would very much like to compare some results. You are the only person outside China I found so far who has received their board. My temps are also high, but somewhat acceptable. 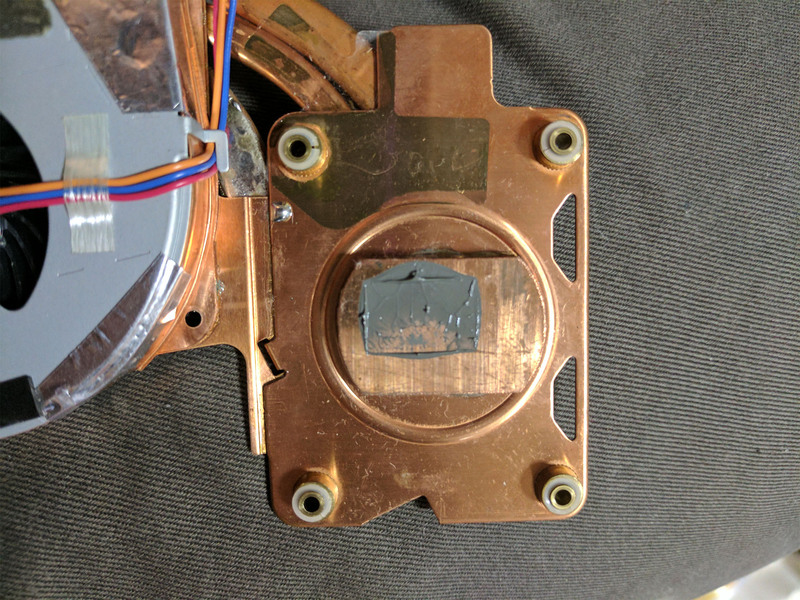 I ended up using liquid metal on the heatsink (conductonaut) in order to bring temps down from over 90 degree celsius to 85 degree celsius when running the AIDA64 stress test. Idle temps are great and the fan only turns on every two minutes or so. What I wonder most is: Does closing the lid make your T70 sleep? For me it doesn't work and I can't quite figure out why. Reopening does work, but usually leads to crash on wake which also frequently happens if I use other methods to wake the machine. I am using Windows 10 Pro, latest version available. I only installed a few additional drivers, such as the latest Realtek Ethernet driver and a trackpoint/trackpad driver I found on 51nb. The other issue I can't figure out is about the battery. 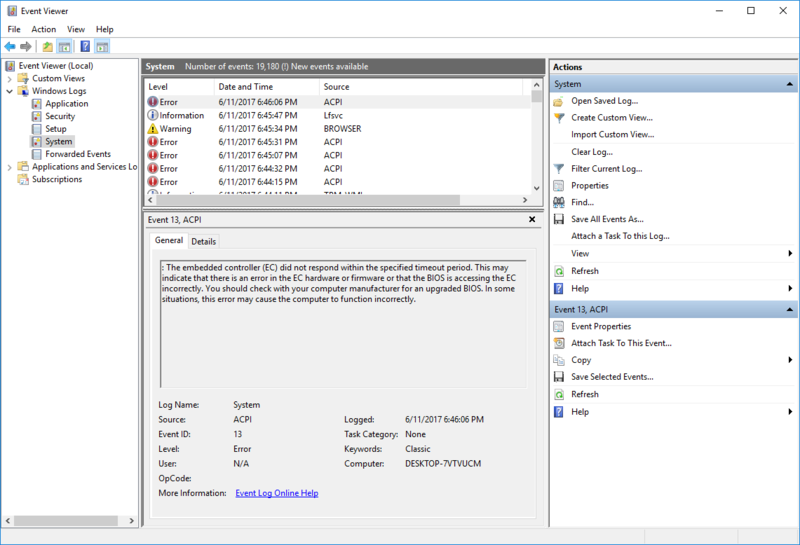 Windows 10 does not react correctly to removing/inserting the battery and/or unplugging the power cord. The windows battery icon always stays the way it was during startup. The battery icons still work and I guess it gets charges when the light is orange, but something is missing that passes the info to windows and I have no idea what. Is that the same for you? Oh and some more info after I read through your posts again. I had no problems seating the heatsink. It doesn't look so great and you really need to make sure to remove material at the right spots. There is now a manual on the lcdfans page on facebook. There's also two manuals on 51nb.com. There are quite a few minor spots that need modifications besides the obvious stuff above the RAM slots. 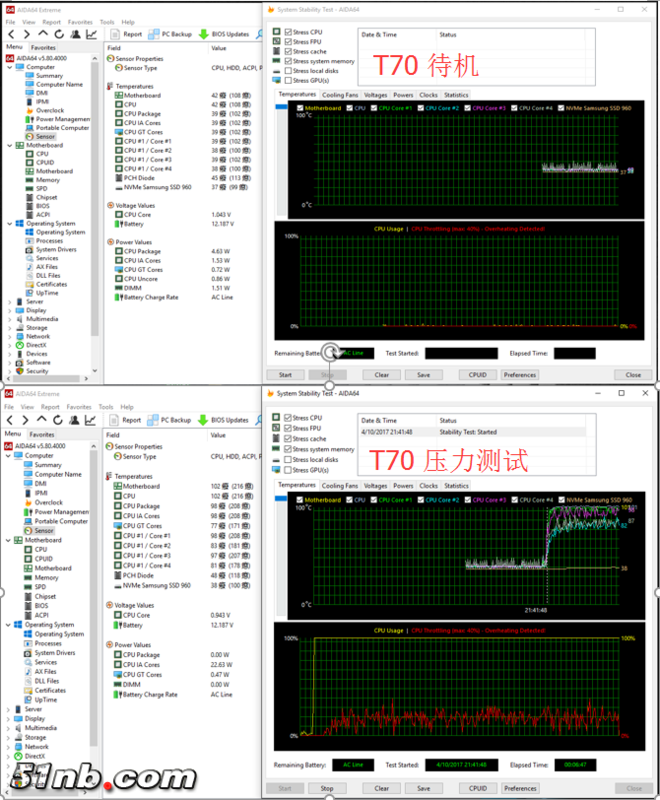 For comparison: With my RAM overclocked to 2666, my T70 achieved a score of 750 in cinebench R15. Overall I'm already very happy with the machine, I just want to somehow solve those machine sleep problems I encountered and then it would be my perfect retro thinkpad. Hey, I've also been reading your posts on thinkpad-forum.de I have the same problems with the lid and with the battery/power cable. The power cable recognition does appear to work a couple times after booting, but not instantaneously. If I turn the computer on and then unplug the cable, there will be no immediate effect, but the icon will change after a minute. It can be accelerated by trying to adjust the brightness within Windows. When this happens, the system will freeze for a second. The same thing will happen when plugging back in. After this, it doesn't seem to respond at all anymore. However, these errors stop being logged after the first few, just as the battery icon becomes totally unresponsive. I think the embedded controller or ACPI subsystem is sending badly-formatted data to the OS, which then ignores it after the first few times. This could probably be solved either in the BIOS or OS side, but I don't know enough to figure it out right now. I will make a post on 51nb and see if anyone has a solution. I think that they've discussed/solved many issues like this in QQ or wechat or whatever, without leaving any public record, so there's a good chance a solution does exist already or is at least being developed. Some thickness was also removed from the opposite side. Only removing the two cross-members to the left of the CPU was not sufficient, because when the heatsink was clamped down it was still pressing against the frame, with the frame being braced against the inductors/the perpendicular beam on the upper left. If yours is working fine without such extensive changes, it may be variation in the quality control of the heatsink, particularly the copper block they soldered on. I wouldn't be surprised if mine is actually at a slight angle. Or alternately, you may still have some pressure variation, but the high conductivity of the liquid metal TIM is making up for it. I saw on thinkpad-forum.de that you were having some difficulty with the UltraNav, but Windows automatically installed a driver that's working well. I have a score of 723 in Cinebench with 2400mhz memory, which seems reasonable. Mod note: time to read the Forum Rules! Pictures WAY too big, tags removed. Thank you for the reply. It's great to know the lid problem isn't just happening for me! I did write to Jacky about it in the meantime. I'll share any info I get here. For windows7 it seems Hope wrote a modified ACPI driver. I can download it, but I can't get it to install in windows 10. How are your temperatures? Even before I used liquid metal, I had consistent temps for all cores. Temps were too high and thermal throttling kicked in, so I used the liquid metal. I need middle-click scroll functionality and in the meantime I found a trackpad driver on 51nb.com that mostly works. Sometimes the trackpoint looses functionality after sleep, but with this driver it at least starts working again once the touchpad is used. It's not available for Windows 10 because theoretically it's already integrated. It might be useful to try installing Windows 7 and testing it the problems are solved. My idle temperature is around 40 (fan stays off), but load is over 90. OCCT stress test stabilizes around 90, but the 3D rendering software Keyshot goes up to 95. The ambient temperature here is currently 28. I already ordered the liquid metal, so I'll try it since you had good results. Have you used liquid metal before? You need to be extremely careful! I use heat resistant vinyl tape (3m/scotch super 33+) to mask the contacts on the cpu die in case any metal gets spilled. If it touches contacts, the cpu probably is destroyed and in this case the whole board. People do this to alienware gaming laptops like so: http://forum.notebookreview.com/threads ... 489/page-4 .. there's a few guides for alienwares on the web, but some added insulation is absolutely necessary. Jacky replied to me that temps should be below 85 degrees and that my heatsink is probably not sitting correctly on the die. I don't think so and thanks to your shared temperatures I'm even more confident mine is making good contact and lower temps in my opinion are not possible without slowing down the cpu or having a stronger fan. He also told me the lid close issue comes from my display cable and suggested I should replace the cable. This doesn't make any sense because the same cable + display works perfectly fine on my other Frankenpad and the other display I have produces the same issues with the T70 and now I see the ACPI errors as well - so here's hoping for a new Bios/EC firmware. I looked at your frame modification picture again. I think you missed removing the lower strut above the 4 VRMs. That probably means your frame isn't properly sitting on the motherboard and that's why you needed to remove more material on top. However I recommend you remove that strut as well because you might have motherboard flex like that. I removed more of that than even the chinese manual showed. Last edited by pflugshaupt on Mon Jun 12, 2017 7:24 am, edited 1 time in total. And I checked the Windows Event Viewer on my X62 and unfortunately it is showing the same error while closing the lid and battery stuff still works fine. Rather than post 4 times in a row, next time please use the right hand EDIT button below your last post. You can then make changes/add stuff in there to your heart's content. I was originally trying to get away with removing as little frame material as possible, so I wanted to avoid completely removing the struts if I could. On the strut that remains, I can see that it's no longer pressing on the copper plate or the inductors because I can freely slide a piece of paper above and below it with the heatsink mounted. It probably would have been better to totally remove it in the beginning, but none of the 51nb posts mentioned interference with the heatsink contact, so I thought it was avoidable. I looked for temperature information and was able to find one example, in a post from dh3001. In his graph, you can see two cores are close to 100 degrees, with the other two in the 80s. This is similar to the original results I had before cutting more. From his previous posts (https://forum.51nb.com/forum.php?mod=vi ... id=1742612) it looks like he did not remove the struts. One other source of trouble may be the heat pipe modification on the heatsink. The original extended large heat pipe on the T500 heatsink is replaced by a shorter one for the T70 heatsink. On my unit, this new heat pipe has some kinking and crinkling. You can see in the picture I posted earlier. I do not know what the tolerances for bending heat pipes are, but I assume this deformation could have a negative effect. Does the large heat pipe on your heatsink also have kinks, or is it consistent with the other two pipes? My large heatpipe looks good. In fact it doesn't even look modified, seems very well done. I my opinion having that solid block of copper between the cpu and the heatpipes isn't great. The heatpipes should be closer to the cpu for better results. However the real issue I'm seeing is that I don't think my fan can remove enough hot air. If I run stress tests, it takes the system at least 15 minutes to reach stable temps. That makes me think it's just not able to push out all the heat. I wish it could turn faster, but it just doesn't. I will try running it on a laptop cooler to see if that additional air push could make a difference. The solid copper block on my fan had some imperfections, it doesn't really look lapped at all and I had a spot that was higher which I removed before installation. But it seems my fan is better built than yours or the one used in the system you saw on 51nb. Annoyingly, my fan makes a noise on the lowest RPM... like something was a bit loose. Compared to the graph you posted, my system is much cooler and the core temps are within a few degrees of each other and it takes my system much much longer to reach the max temperatures. Also I did stress the GPU as well, which makes some difference! I will make a 30 min graph once I can locate my AIDA64 serial. This was 20 minutes of stress testing and then 5 min almost idle. My room temp is 27 degrees celsius. Great news: It appears my CPU is stable with a -100mV Undervolt. This brings temps down over 10 degrees.. now they are below 80 during the AIDA64. I hope this turns out to be stable and I'll now test again including the GPU. Anyway undervolting almost seems to be a must with this T70 board. XTU has to be enabled in the BIOS and the BIOS does have a CPU voltage offset field I'll use instead of XTU once I figure out the max. stable offset. Update: I now just put -100 in the Bios "Core Voltage Offset" field inside the overclocking menu. Overclocking first needs to be enabled. The crazy stress test that includes the GPU still goes slightly over 90 degrees, but this still means throttling is no longer happening even during stress testing. Without the GPU the 80 degree mark is not surpassed (in a rather hot room). 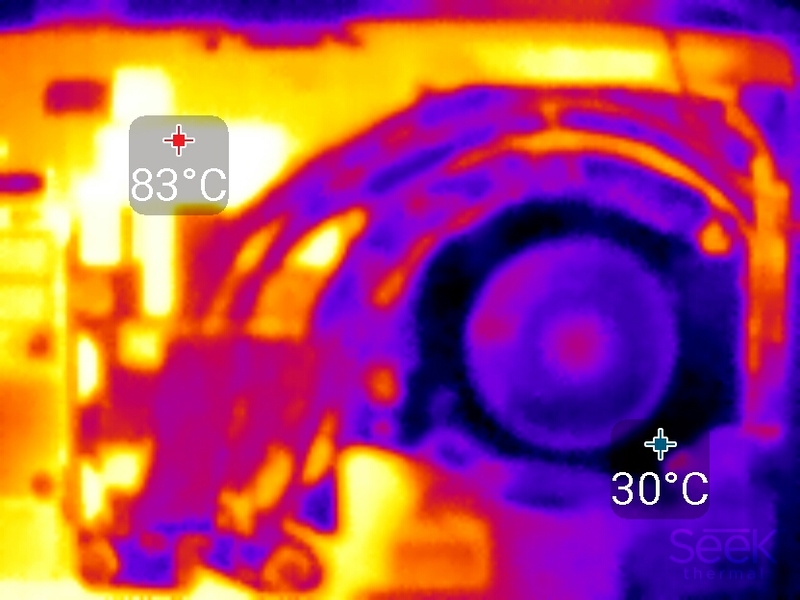 I looked at the heatsink with a thermal camera trying to determine if my kinked heat pipe was causing a problem. I did not notice a difference, but I did see that all 3 pipes were not getting nearly as hot as they should. I think this strongly implies that the weakest point is the copper block, which is not transferring heat to the pipes as quickly as the radiator can remove it. The copper block should be replaced with a vapor chamber, but I don't know where to get one separately. Undervolting is a great idea and I'll try that soon. I'm traveling now and won't be able to test anything for a week. I also have a solution for external nvidia GPU accelerating the internal laptop LCD. There is a catch, but it's not too bad. 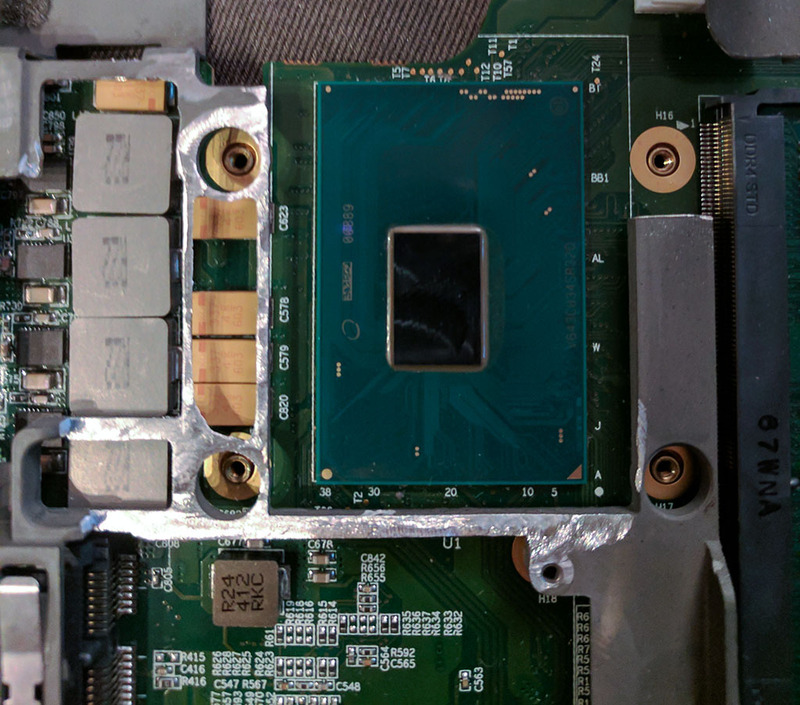 GPU should be on before or at power on of the laptop. Install nvidia driver 368.81 then the latest without rebooting in between. Should now have full functionality on a display attached directly to the card, but with applications started on the internal LCD still running on the iGPU. This part is the catch. To get the external GPU to render to internal, start the application on the external monitor and then shift it to the other screen. It should keep working as expected, within the constraints of your PCIe bandwidth. You don't need an actual monitor attached; you can use a dummy plug and then super+shift+left/right to move a program to the main screen. This workaround is necessary because nvidia Optimus isn't activating. I think it's because hotplug of GPUs isn't actually​ working. Other PCIe devices hotplug fine, bit I still can't get it to recognize a GPU after boot. Could your heatpipes be empty thanks to (invisible) cracks? My heatpipes do get extremely hot to the touch when the CPU reaches 90 degrees. Certainly not 90 degrees, but too hot to keep your fingers on them. Now I'm undervolting even more. -120 mV still seems to be ok. I read that laptops with the same cpu can sometimes even manage -150mV, but it probably also depends on the default values the BIOS uses. Maybe this T70 just uses too much voltage by default? With the GPU enabled, the system still reaches 90 degrees, but no more throttling. It's a Intel 630 GT2 GPU btw. I think temperatures under 80 degrees in summer are quite okay for this CPU. It's a CPU used frequently for gaming laptops and as far as I know this kind of temperatures is normal for them. According to dh3001 from 51nb, the ACPI problems are known bugs and should hopefully be fixed in a future BIOS update. So, just need to work around it for now. Maybe, reworking them (like they did to convert this heatsink from the T500 part) without damaging them is supposedly pretty hard. It'd be best to check out some known-good examples with the thermal camera to compare. I'd love to help you but I have no thermal camera. Is there a cheap way? And a new Bios is out. Now the backlight turns off when I close the lid.. still no sleep though. The annoying thing about this problem is that sleep via Fn+F4 or the power button would work perfectly well, but once I close the lid, I always get the failed wakeup attempt on reopening which leads to a reboot. So the machine has to stay open while sleeping. It would be better if the sensor did nothing as long as it's not working, but there seems to be no option in the bios I can find to turn it off. Thermal cameras arent very expensive nowadays. I think you can get one for 50$. "Thermal cameras arent very expensive nowadays. I think you can get one for 50$." where? how? the ones I see are at least $250.